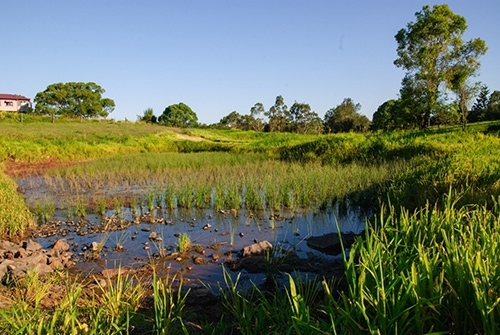 In 2013 we constructed a $180,000 stormwater treatment wetland in North Lismore to improve water quality flowing from the Slaters Creek catchment into the Wilsons River. The two wetland cells – featuring aquatic reeds, rushes, sedges and accompanying edge plantings of native trees and shrubs – will complement the extensive restoration of the surrounding areas undertaken by the Banyam/Baigham Landcare Group. The constructed wetland represents today’s best-practice for treating stormwater quality, mimicking a natural wetland’s ability to reduce nutrients and other pollutants in waterways. Wetlands are often described as the kidneys of the landscape, and it is due to the extensive draining and filling of natural wetlands that so many Australian river systems have poor water quality. This technology has become common in metropolitan estates where low-lying land is used to treat stormwater and create attractive dual purpose open space. While wetlands technology costs more than installing traditional stormwater drainage systems, it reduces problems downstream caused by poor water quality issues. The minimal extra cost is outweighed by the greater environmental benefit. The constructed wetland is performing well and there is potential to naturalise 16 other sub-catchments within the LGA. Just four months after establishment, two species of native frogs had moved in as well as some new native aquatic plants.